Mike McCormack played 12 seasons of professional football. His career, starting in 1951 and ending in 1962, included stops with the New York Yanks, Dallas Texans and Cleveland Browns. Following his playing days, McCormack would go on to coach professionally and act as an NFL general manager for another 30-plus years. Having passed in Southern California back in 2013, McCormack gave his all to football. That’s true for those who spend as long in the NFL as he did. But what we don’t talk about enough is how a career of his ilk has an impact on family members. Writer Michael McCormack, his son, is attempting to change that in a new book. 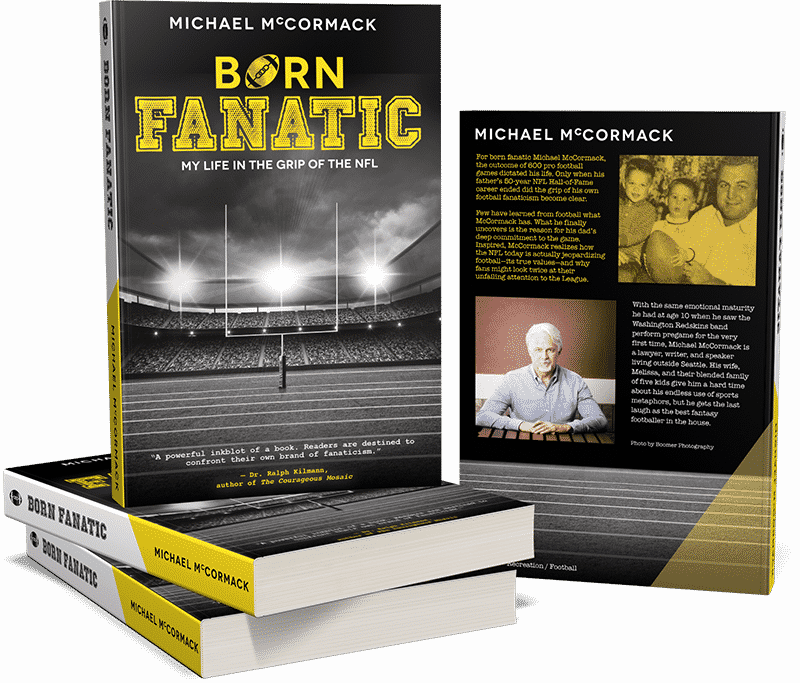 It’s titled Born Fanatic — A Behind the Stadium Look into a Son’s Life in the Grip of the NFL and is set for release in April. Following his father’s death, the younger McCormack had a reckoning of sorts. Having grown up immersed in professional football, he realized it shaped his view on life, family and what’s important for a man. He also came to the difficult understanding that he viewed his own dad more as a coach and a player than an actual father figure. Sportsnaut received an advanced copy of the book. And this scribe has to say the story is powerful in that the relationship between Michael and his father is something others who grew up around football know all too well. But he’s one of the first to write in length about said relationship. It’s as passionate and eye-opening as it is real. Having been around the game for decades, McCormack also gets into details about how professional football changed during a time of civil unrest and proliferation of racial issues in the United States. It’s somewhat of a coming-of-age story with a psychological backdrop of his relationships within the family structure. Much of what he details in the book could be seen as micro, but a larger part of it is macro…essentially societal in nature. Rarely do see see a book that’s so evolved. It’s not simply Michael’s way of questioning his father’s love for the game of football and how it impacted the family structure. Instead, it gives us a glimpse into just how much sons, daughters and wives are impacted by a sport that asks for so much. McCormack is a Hall of Famer. He spent nearly 50 years in professional football. This means that his family also spend those near five decades dealing with the complexities of a man who valued the game at a high clip. Simply said, if the older McCormack had not shown that passion for football, the game itself would have passed him by. It took McCormack well over four years from the time his father died to the time the book itself is set to be released. During that time, he went from complaining about his father’s career in football to coming to a realization himself. The idea for McCormack was not to attack his father posthumously. It was meant for him to have an outlet of sorts while grieving a loss. In turn, the book gives readers a larger-scale understanding of the makeup of professional football. How it impacts those close to the game. It’s an unnerving look into the complexities of relationships. For avid book readers like this scribe, Born Fanatic is similar to Tim O’Brien’s The Things They Carried. Both are unflinching looks into the psychological genetics of those who dealt head on with what life brings and were able to come to somewhat of an individual transformation in the process. We would recommend this read for even those of you who are not avid football fans. As a lawyer, McCormack was able to create a story that transcends sports and brings all of us to a deeper understanding of how success can have often unforeseen secondary impacts on both the person and those close to him/her.